Zong Shi is not happy to see the virtual Night asking Xiao Fei for a morning kiss. So he immediately grabs up the hologram and takes Night out of Xiao Fei’s room (he was there to wake her up as he heard her alarm go off). Xiao Fei is unhappy that Zong Shi really did mean to move in. Life was complicated enough without adding to her stress. 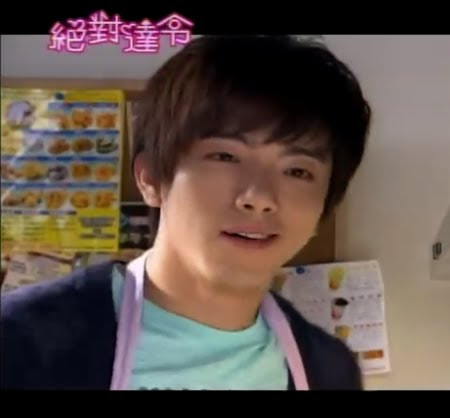 We then get a really cute scene with Night and Zong Shi in the kitchen preparing breakfast. Night criticizes Zong Shi’s cooking skills. Zong Shi says he knows what Xiao Fei likes and Night brings up the fact that while Zong Shi knows her past, Night has the advantage of knowing her likes and dislikes from living with her and Zong Shi just throws back that Night is programmed. 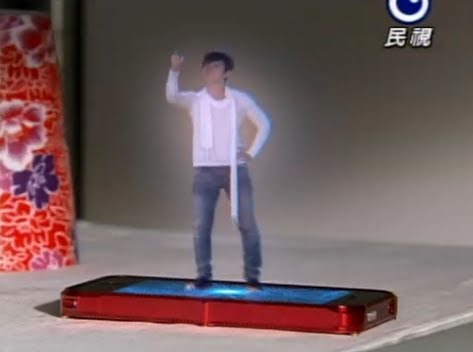 Watching Zong Shi’s fight with the little virtual Night was hilarious! And Zong Shi smirked! I think this is the first time we saw that. Ahh, Kun Da. Loving you more and more (heehee, that’s actually a name of a Fahrenheit song from Jiro’s ToGetHer). Zong Shi heads off to work with Xiao Fei and is disappointed that she has brought Night with her. What really displeases Zong Shi is just how close she is to her robot boyfriend. They have been friends for years and they have this barrier between them that does not exist between her and Night. Before Xiao Fei can reply to this question, they see Sky rushing up to Zhi Xi who ignores him. Awww. Poor Sky. He then grabs her and wishes to discuss what happened the night before with the kiss. Zhi Xi, cool as always, blows it off as no big deal and leaves without listening to what Sky has to say. This makes Xiao Fei and Zong Shi wonder just what is going on with the two. It is no surprise that they are shocked as Sky has never made his male preference secret. In the office, Zhi Xi continues to ignore Sky, poor chap. Xiao Fei applies for leave for Night saying he is sick and recuperating in his hometown. Since Night did a lot of the handiwork odd jobs ad the office, that means his work must be delegagted to someone else. That would be the next most manly person in the office. Sky immediately volunteers himself. LOL. But the manager chooses Zhi Xi!!!! Oh, wow. This doesn’t bother Zhi Xi at all. Sky immediately rejects this, but he is overruled since he is the furthest from being manly and he always pawned jobs off on Xiao Fei and others. Sky still offers to help and Zhi Xi turns this down and asks Xiao Fei to do it instead. Zhi Xi is changing a light bulb while Xiao Fei is spacing out instead of actually helping. When Zhi Xi comments on this, Xiao Fei tells her that she accidentally overheard that Zhi Xi and Sky kissed. How did that end up happening? Zhi Xi says that it’s simple – Sky got drunk. Xiao Fei then wonders why if that was the case, did Sky looks so down. Zhi Xi looks uncomfortable and changes the subject back to the operation at hand. Xiao Fei rushes off to go get a new bulb and while she is gone, Zhi Xi slips and falls to the ground. Sky hears something and rushes off to save Zhi Xi. 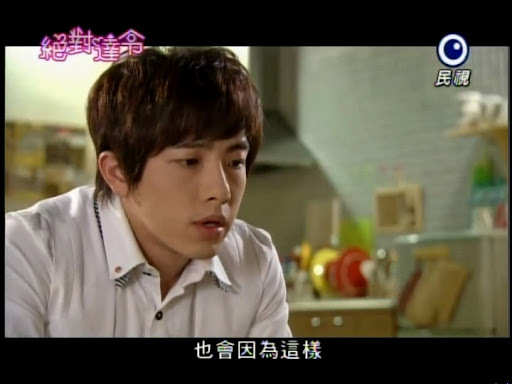 He finds her unconscious and asks the newly returned Xiao Fei what happened. How would she know? Anywho, isn’t it obvious Zhi Xi fell? Sky proves his manliness by swooping down and picking up Zhi Xi and rushing her to the hospital. Xiao Fei goes to the hospital later to check on Zhi Xi and finds Sky there holding her hand. Awwww. Sky is in LOVE! It’s so cute…and yet so weird…given his earlier actions. I also wondered why we were doing this love line NOW with so little time left to really develop, but wouldn’t you know? This story ties into Xiao Fei’s dilemma with Night. Anywho, Sky professes his love for Zhi Xi. He didn’t kiss her because he was drunk, but because he wanted to be certain that his feelings for her were real. Unfortunately for our Sky, Zhi Xi does not wants to accept him at all and orders him to leave. It is hilarious actually watching Xiao Fei drag him out. I must admit that Xiao Fei was being a wee bit rude. And when I say this, I mean by staying and listening to Sky’s confession and his personal conversation with Zhi Xi. She should have listened out in the hall instead of so obviously in the room. But that’s just my opinion. But I guess, like Gong Xi (Skip Beat! ), Xiao Fei is just being honest with her actions as she is really interested in what happened between them. Xiao Fei eats lunch with Night and Zong Shi. She wonders aloud why Zhi Xi didn’t give Sky a chance. Zong Shi points out Sky’s actions and his multiple flirtations with Night. Why would Zhi Xi trust a guy like that when he confesses? When Night asks why this should be the case, Zong Shi replies with it being about human nature which a robot wouldn’t understand. Little Night is upset by this. Yes, he’s a robot, but he will try to understand. Zong Shi tells him not to waste his effort. Poor Xiao Fei gets more and more uncomfortable. Night notices this and asks her what is wrong. Xiao Fei says she just needs to use the ladies room and goes off. 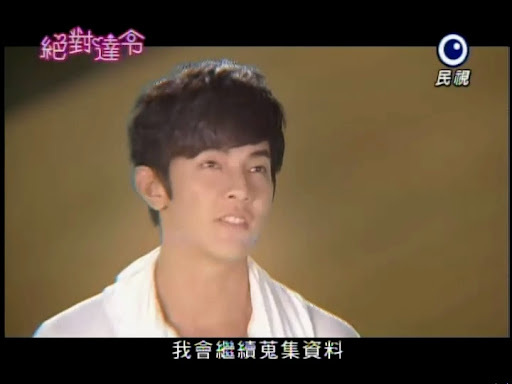 Zong Shi says it is obviously because of the situation with him and Night and tells Night to give up. Night throws those words back at Zong Shi who looks over and notices a flower pot falling (seriously it looked like it was THROWN, but whatever). Zong Shi quickly lunges and shoves Xiao Fei out of the way. He gets the flowerpot smashed on his ankle instead. At the apartment, Xiao Fei bandages up Zong Shi’s leg and offers to buy dinner for his little brother. Zong Shi wants to go with her, but Xiao Fei refuses as he is injured. Night then offers and we get an uncomfortable pause before Xiao Fei vetoes the idea. She is just going to a nearby store to buy a boxed dinner for little brother. After she leaves, Zong Shi offers to turn Night off to stop the uncomfortable staring contest. Night then thanks Zong Shi for saving Xiao Fei. Zong Shi replies that there is no need for thanks. Night agrees to this and then says (I had to chuckle, poor Zong Shi’s efforts get belittled here by our robotic cutey-pie) that if he hadn’t been just a hologram, he would have saved Xiao Fei AND avoided injury. Zong Shi can’t deny that, but then he throws back about Night’s programming. Night says that he is Xiao Fei’s perfect boyfriend. And what follows is a conversation about love. Zong Shi believes that an imperfect love is more authentic than a perfect love. Why? It is the obstacles, the little disagreements, inadvertently hurting each other, and overcoming all of that, which helps make love even stronger. Night believes that you shouldn’t diss perfect loves (there is no such thing as perfect anyway – even with a robot). Love isn’t always enough. Sometimes burdens and obstacles are what can destroy a relationship instead of strengthening it. That doesn’t mean that the love was genuine, but sometimes harsh reality creeps in and you realize that sometimes, that emotion just isn’t enough. Night’s response is pretty good. He wishes to work at becoming human. He will do all the things that Zong Shi lists and he will turn perfect love into an imperfect, perfect love. At work, Sky has let his appearance go and even gets scolded by the manager for making such horrible mistakes in his work. Sky admits that he doesn’t care about his work at the moment. Of course not, he is more concerned with Zhi Xi rejecting him. Xiao Fei quickly steps in to take care of some of Sky’s tasks (probably because she feels sorry for him and his current love crisis). Meanwhile, Zhi Xi does her best to avoid Sky. Avoidance does not solve the problem, just ask Xiao Fei. Although, sometimes when she tries to confront something head on, the people around her switch to avoidance as they don’t want to acknowledge the truth without a fight. Check out the Wikipedia definition of “stalking”. Okay, back to the subject at hand. 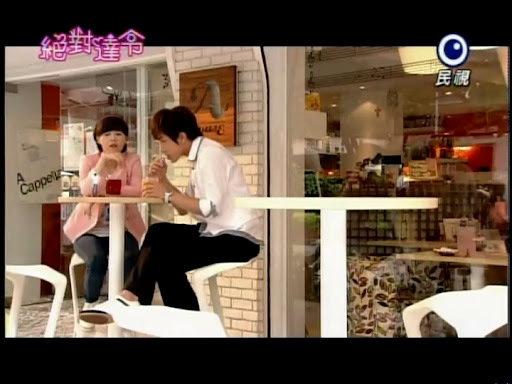 Zhi Xi scarfs down food and tells them to stop staring at her and dig into the food. Xiao Fei wishes to know why Zhi Xi is going to great lengths to avoid Sky. Can’t she give him a chance. Zhi Xi comes back with a human and robot cannot love each other. This causes quite the reaction with our three leads. Zong Shi wonders why she said that and Zhi Xi explains it’s just an analogy. Phew, she doesn’t know the truth. Zhi Xi then says that robots should forget about trying to fall in love like humans. Zong Shi seconds this and Night angrily bursts in that he doesn’t. Why? He feels its unfair to robots. LMAO. And really, are there any robots like that (that Zhi Xi knows of at least), so Night’s protest is almost a dead give away, as is Xiao Fei’s sad face as it really hits home with her. Later Xiao Fei is playing a game while Night cheers for her. Zong Shi comes up. It’s midnight so its his time with Xiao Fei. Zong Shi tells Night to take his time as Zong Shi will be taking Xiao Fei out for an overnight trip. Neither Xiao Fei nor Night seem too enthused by this idea, but if you’re talking about equal footing, Xiao Fei and Night have technically had a couple of overnight trips already (though all of them were interrupted disasters). Zong Shi and Xiao Fei meet up the next day with Xiao Fei complaining about not coming together since they live together. Zong Shi replies that he wants to make it more date-like. He then asks her to follow him with no explanation. Xiao Fei is more willing to do this with him than she was with Junshu. But…did you ever notice that Zong Shi’s personality is a more watered down variety of Junshu’s? I mean, Zong Shi genuinely cares about Xiao Fei and is not always forcing his own opinions and ways on her, but he can be just as bad sometimes or nearly as bad. Xiao Fei follows (after he tells her she looks pretty which she says he said to make it seem more like a date, too, lol). Meanwhile, Night and Zhi Xi are hot on their trail. Night is curious to know the difference in his dates with Xiao Fei as compared to Zong Shi’s. Zong Shi and Xiao Fei run into a child who is all alone. They ask where her parents are and get no answer. They then immediately start picking up the kid and playing with her. Okay. Interjection here. I’m not saying you just abandon a kid you find alone, but to actively play with the child as her parents should be nearby? What parent wants to come up and find some total strangers playing with their child? Or maybe we Americans are just more paranoid. and distrusting of others… Night and Zhi Xi watch this and Zhi Xi comments on how you could almost mistake Zong Shi and Xiao Fei as the child’s parents. This makes Night depressed. Children and a family is not something he can give Xiao Fei (A.D.O.P.T.I.O.N – though how to explain the eternally youthful grandpa?). Zhi Xi notices this downturn in Night’s mood and quickly tries to say that she is sure that Night and Xiao Fei will get married and have their own family. Rubbing salt in the wound just doesn’t work for robots…but that’s what she’s doing technically. Night then ceases his spying activities. We then get this great montage of scenes between Zong Shi and XIao Fei. He takes her camping! 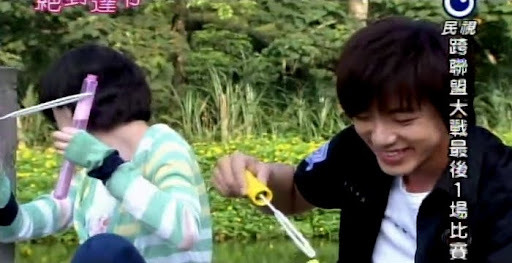 They go to a lake, blow bubbles (KUN DA’s SMILE!!!! ), put up a tent, and have a cookout (Xiao Fei’s teasing with the food!!!!). It is so nice to see their normal interaction. If you didn’t know any better, you’d almost say they are a young couple having a good time instead of just two really good friends (even if Zong Shi is in love with her, he’s still her good friend). And then we get THAT scene. It was a bit of a buzz kill, I have to say. Why? Well…it was just TOO sudden. Zong Shi, Zong Shi. You must choose your moments wisely. Zong Shi takes Xiao Fei to see the fireflies. He explains that their lights indicate their search for a mate (I already knew this, I also knew that fireflies all have different lights, it’s really cool). And totally off topic, this so reminds of of Hotaru no Hikari which had a bit of a focus on fireflies in its story (hence the “Hotaru” part as that means firefly in Japanese). Oh, and while this date was going on, Night and Zhi Xi head back to her place as Night was too depressed to be alone and wanted to accompany Zhi Xi as she packed some things for her stay with Xiao Fei. 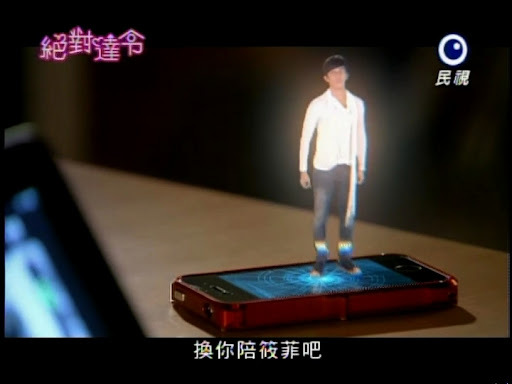 Zong Shi translates the light as basically meaning “Will you marry me.” He then proceeds to propose!!!!!!!!!!!!!!!!!!!!!!!!!!!!!!!!!!!!!!!!!!!!!!!!!!!!!!!!!!!!!!!!!!! I died. I SO would have said yes in a heartbeat 😉 However, Xiao Fei doesn’t even need to to consider this as she has already made her decision. Maybe love between a robot and human isn’t possible, but she wishes to find out since she’s in love with Night. 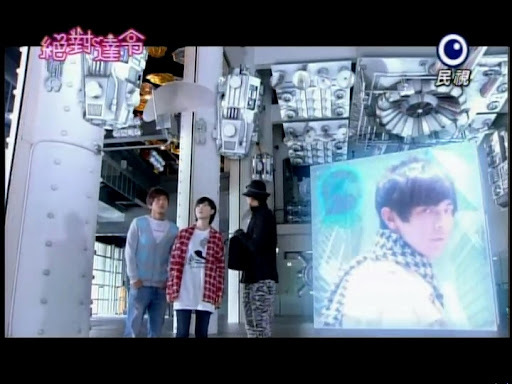 Zong Shi finally picks up that Xiao Fei has set out to reject him from the beginning of the date. Xiao Fei then starts crying and Zong Shi tries to get her to stop, but she can’t. You know she’s hurting as she has hurt Zong Shi. This is a good scene in that we have Zong Shi saying that he never thought she wouldn’t follow his lead as she always had in the past. He had thought he could hold her hand and lead her anywhere, but now he knows he can’t. He will finally let go of her hand. Okay. Actually, it was Xiao Fei who let go and not Zong Shi. It’s heartbreaking, and yet not all at the same time. Back in the city, Zhi Xi and Night run into Sky who is out drinking near Zhi Xi’s apartment. Sky begs her to stay his friend since she won’t accept his sincere feelings. He also explains that even though he always liked guys, he constantly found himself being drawn to her. He can understand why she may not want to be with him as a couple, but he doesn’t care as long as he remains by her side. Zhi Xi refuses this. They cannot go back to how they once were. It’s impossible now. She then says she is staying with Xiao Fei and if Sky keeps pestering her, she will move. I felt so bad for Sky here (even if he is hounding and stalking her). Night decides to stay and keep Sky company instead of going back to the apartment with Xiao Fei. The next day Zong Shi and Xiao Fei return home. Zong Shi tries his best to act as normal (and even teases Xiao Fei for being uglier with her puffy eyes from crying), but you know Xiao Fei is feeling awkward. Zong Shi also announces he is moving back out as it is obvious he has no reason to stay in Xiao Fei’s apartment. XIao Fei goes in and finds no one home. She opens the bathroom door and catches Zhi Xi changing. Zhi Xi’s back is covered with scars! She and Xiao Fei sit down and Xiao Fei apologizes for walking in on Zhi Xi changing and then asks what happened. Zhi Xi explains there was a fire when she was 10. It killed her parents and scarred her back. Her grandfather took her in and taught her to love money over men. This way she can take care of herself if no one wants to marry her because of her scars. Xiao Fei deduces this is the real reason Zhi Xi won’t give Sky the time of day. Zhi Xi then explains that her grandfather was right to teach her about money since every guy has rejected her thus far. The two girls are then interrupted by a phone call from Sky. Xiao Fei says she will answer it if Zhi Xi doesn’t want to. 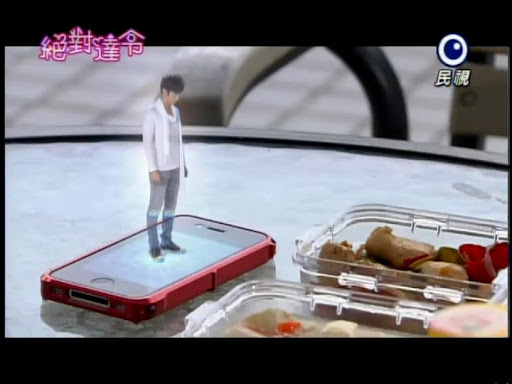 Zhi Xi hands the phone over and Xiao Fei is surprised to hear a different man’s voice on the other end. It turns out it is a police officer and Sky was in a car accident. His phone showed that Zhi Xi was the last person he called, so they want her to come and identify the body. This freaks Zhi Xi out. You really see just how much she cares about Sky. She rushes out of the apartment followed by Xiao Fei who runs into Zong Shi who gives the two girls a lift. On their way to the hospital, Zhi Xi happens to catch sight of Sky! She has Zong Shi pull the car over and she rushes out and hugs him. He’s not dead after all! Zhi Xi is so happy. Sky explains that he was on his way to the station as he forgot his phone in the taxi and learned that the cab had gotten into an accident. Zhi Xi is angry, but she is more relieved that he is alive. Sky then reveals that he doesn’t care about her scares (he searched for her information and found an article about the fire). Well, that relationship is resolved now. Xiao Fei then asks after Night. She wants him back. An apologetic Sky hands over the phone saying it must have broken as he can’t get it to turn on. 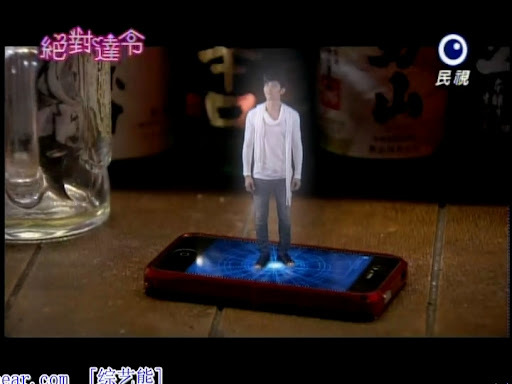 Xiao Fei anxiously calls Lei Wu Wu who says it is Night and not the phone that is broken. Say what? Xiao Fei and Zong Shi return home to find Wu Wu and his COO. The COO coolly tells Xiao Fei that Night is malfunctioning. Xiao Fei wonders why they can’t just repair him easily since it was the damage from the fight with the other robot. Baoqui states that is not the reason why Night appears to be broken. The little boy, however, won’t tell Xiao Fei exactly what is wrong with Night. He just says that she will be getting a replacement robot. Xiao Fei is flummoxed. Just what has happened to her Night? She goes and looks at all of Night’s “memories” (his polaroids) and thinks about how much she misses him. The next morning Night’s replacement arrives courtesy of Lei Wu Wu. Zong Shi also pops in. Wu Wu shows her the new Night robot. He is apparently Night’s backup. The two are identical. Wu Wu then says that the new Night has been programmed with all of Xiao Fei’s preferences. She remains silent and finally says after Wu Wu encourages her to kiss and boot up the new robot that is not Night. She wants HER NIGHT. The one she shares her memories with. She demands that Wu Wu take her to him. Wu Wu refuses until Zong Shi threatens to expose Kronos Heavens. Wu Wu takes the two to Kronos Heaven’s private island. Xiao Fei notices a picture of a man who looks a lot like Night in the lobby. Wu Wu explains that it is the founder’s son who died young. Xiao Fei is amazed to find out that Night is modeled after the big brother she had met when she was a little girl. More over, she swore to that man that she would find her true love and hold onto him. What are the odds, right? This is such an A.I. moment. In that movie, our beloved little boy robot was, in fact, an ode to the head honcho’s dead son. Meanwhile Baoqui and two scientists are working on reformatting Night. We learn that he has become self aware. The men there have forcibly tried reformatting Night (the hard way) to know avail. Just before it completes there is an error. There is also a part of Night’s memory that was not programmed. Baoqui figures that it is what Night himself has created. How is that possible? Night shouldn’t be able to do that! When Night hears that they are trying to reformat him, he gets angry and tries to bust out of his cell-thingy. The scientists request Baoqui’s help in stopping Night. The COO rattles off his random string of numbers, but Night DOESN’T shutdown! Baoqui seems quite displeased that Night has evolved beyond his control. Enter Xiao Fei, Zong Shi, and Wu Wu. Xiao Fei learns about the reformatting, but is optimistic as Night remembered here with the whole Mei Jia fiasco, so she would only need to kiss him again. Baoqui replies that Night needs a forced reformatting to erase ALL of his memories. This makes Xiao Fei extremely unhappy, not just because she doesn’t want Night to forget her, but because she knows how happy having those memories made Night. Neither Wu Wu nor Baoqui come right out and tell her that she is 100% the reason that Night is malfunctioning, but Xiao Fei gets it. She really does. She then asks if Night’s ring can pick up her mood. She is told that the ring doesn’t work in Kronos Heaven headquarters. Xiao Fei then asks to speak to Night and that’s where we end it. Ah, this makes me want to curse like a drunk sailor. Only two more episodes left. Ah, Zong Shi. It was really sweet of him to mention the Mei Jia incident (after he got it figured out what happened) and encouraging Xiao Fei to have hope in her relationship with Night because of that. Who would have saw that coming? thanks for the summary !!!!! !